Two in 5 executives at South Korea's public corporations have been appointed through political connections without regard to their work capability or professionalism, a report said Wednesday. The report by CEO Score, which tracks corporate management, showed 118 out of the 316 executives at 35 state firms and their 12 subsidiaries are former government officials or politicians. Those executives who have been parachuted in from the outside account for 37 percent of the total. Such a practice is called "a parachute appointment" in South Korea, which suggests preferential allotment of ranking posts based on connections rather than credentials or relevant experience. Of the 118 executives, as many as 75 served in government posts with political figures taking up the remainder. A total of 75 executives at the public institutions come either from President Moon Jae-in's campaign team or the predecessor of the ruling Democratic Party, according to CEO Score. 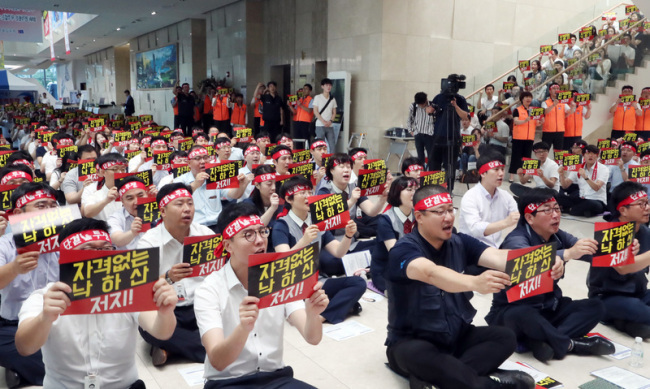 South Korea's opposition parties often criticize the government for appointing figures with connections to the president or other political bigwigs for senior posts at public corporations.